Q. When is the next auction? Q. How do I sell something at your auction? Q. Do I have to be there if I'm selling something at your auction? Q. How can I get on your mailing list? Q. When can I preview what you have on auction? Q. Do you have online bidding? Q. What are the terms for payment? Q. When is payment made for items I consign to auction? Q. What type of paperwork is needed if I want to sell a vehicle at auction? Q. How long do I have to remove items from sale site after purchasing? Q. When do I receive the title if I purchase a vehicle? Q. Do you have any guarantees? Q. What does it cost to register? A. Click here for Auction Dates. A. 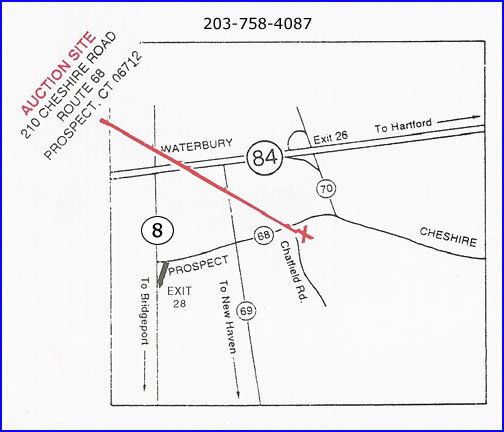 210 Cheshire Road Prospect, CT Route 68.
and site on left. Click for Map. Go right on to Chatfield Road and go straight across into site yard. A. Call the office at 203-758-4087 / 800-201-4368 and request a consignment form. A. No, you do not have to be present. 203-758-4087 / 800-201-4368. Click for Email. A. You can preview items the Friday before each auction. A. The auction starts at 9:00 a.m. on Saturday. any questions about online bidding, check out the Online Bidding Help Page. A. We now accept credit cards with an additional 5% buyers fee. we will accept 25% down the day of sale and the balance by the following Tuesday. A. Checks are issued the following Friday. A. We need the title (in your name) when the vehicle is delivered to sale site. At the time of delivery we will have you sign a Bill of Sale form also. sale date, it/they will be sold in lieu of storage. A. Titles go out certified mail 10 working days after the auction. A. Everything is sold "AS IS, WHERE IS" without any guarantees or warranties expressed or implied. an additional 5% Buyers Fee.